The largest living cartilaginous fish, of the order Orectolobiformes, is the Whale shark (pictured above) verified in size at up to 13.6m/45' long and 20 tonnes. 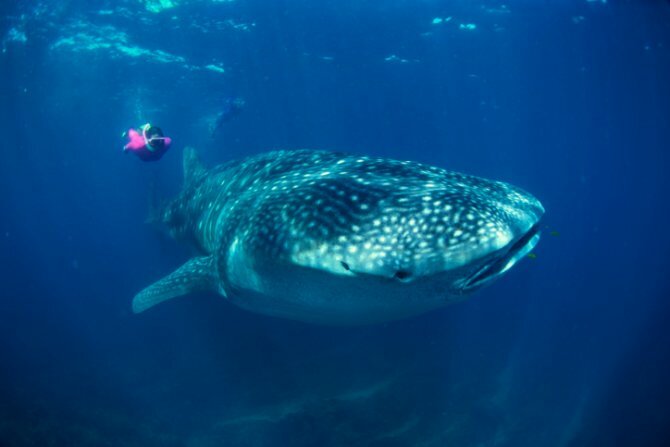 There are many accounts of larger Whale sharks, but these are unverified. Most authorities now give the crown of the largest catfish to the Mekong giant catfish, Pangasianodon gigas. This huge fish has been recorded at a size of over 2.7 m/9' and a weight of 293 kg/646 lb. However, the Wels catfish, Silurus glanis (pictured above) may possibly be longer. The largest wels scientifically recorded was 3m/10' and 220 kg/484 lb. 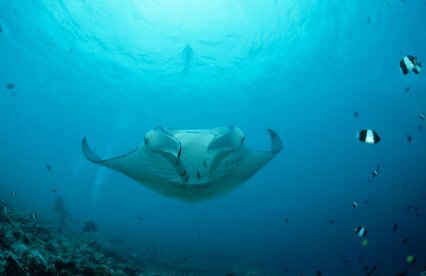 Both the largest species of this order and the largest of the rays is the Manta ray, Manta birostris. This peaceful leviathan can reach a size of 3 tonnes, a "disk" width of 7.6m/25' and a length of 5m/16.5'. The largest known freshwater fish is the huge Beluga sturgeon (Huso huso). The maximum recorded size of this endangered species is nearly 7.9 m/26' and 2,075 kg/4,565 lb. The largest living bony fish is the Ocean sunfish (Mola mola), a member of the order Tetraodontiformes. Sunfish have been recorded at sizes as large as a length of nearly 3.6m/12'), a height of 4.5m/15' from fin to fin and a weight of about 5,000 lb/2,300 kg. The largest species of cyprinid today is probably the Giant barb (Catlocarpio siamensis), which reaches a size of as much as 3m/10' and a weight of as much as 300 kg/660 lb (picture above by Lerdsuwa, Creative Commons). In centuries past, the Mahseer (Barbus tor) was reported to reach similar or even larger proportions, but large specimens are quite rare recently. The largest of the gar, and the largest entirely freshwater fish in North America, is the alligator gar, Atractosteus spatula, reaching a size of 3m/10' and 127 kg/279 lb. The bulkiest species of Sea cucumber is Stichopus variegatus, weighing several pounds, being about 21cm/8.3" in diameter, and reaching a length of 1m/3.3' when fully extended. Species of sea cucumber in the genus Synapta can reach an extended length of 2m/6.6', but are extremely slender. The largest of the bivalve mollusks is the giant clam, Tridacna gigas. Although even more enormous sizes have been reported for this monstrous but passive animal, the top verified size is 600 lb/270 kg, 1.17m/3' 10" in length and 0.76m/30" wide. The largest bivalve ever was Platyceramus platinus, a Cretaceous giant that reached an axial length of up to 3m/nearly 10'. 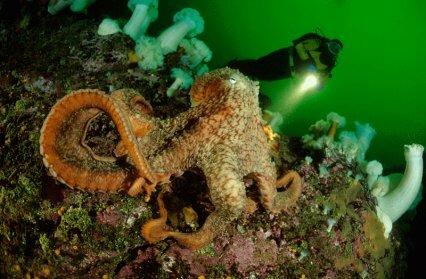 While generally much smaller than the giant Architeuthis and Mesonychoteuthis squid, the largest of the octopuses, the North Pacific Giant Octopus, Enteroctopus dofleini, can still be huge. The largest confirmed weight of a Giant octopus is 71 kg, with a 7m/23' arm span. The Lion's mane jellyfish is the largest cnidaria species, of the class Scyphozoa. The largest known specimen of this giant, found washed up on the shore of Massachusetts Bay in 1870, had a bell diameter of 2.5m/8', a weight of 150 kg/330 lb and possessed tentacles as long as 37m/120', making it one of the longest extant animals. 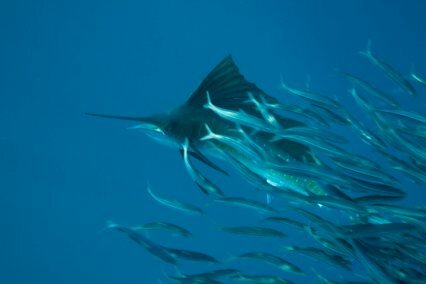 The world's fastest swimming fish is the Sailfish, Istiophorus platypterus swimming at up to 68 mph, or 110kph. It's followed by the Marlin, at 50mph, 80kph. The deepest ever living fish is Pseudoliparis amblystomopsis at depths of 7.7km (4.8 miles) in the Japan Trench in the Pacific. Pufferfish are the second most poisonous vertebrate on earth (the first one is Golden dart frog). The Stonefish is the most venomous fish in the world.